Eve offers Simple, Spiritual, Private, meaningful ceremonies. Whether you are getting married, renewing vows, or simply having a sacred ceremony to honor next steps, we can help you. Our goal is to help you to customize this sacred event to reflect exactly the message you wish to convey. Two ceremonies—one traditional and one non-traditional are offered for you as a starting point. 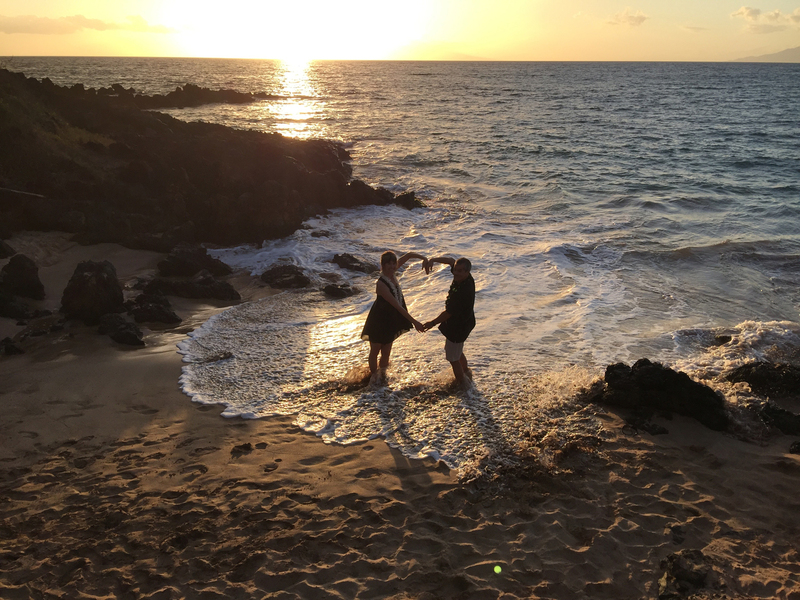 We offer LGBT ceremonies, full moon weddings, labyrinth weddings, underwater Scuba weddings and weddings in the shark tank at the Maui Ocean Center. If you can dream it, we will work with you to create it. Whether on the labyrinth, beach or sea, Eve will work with you to design a ceremony to honor this special moment in your life. Eve has performed weddings on top of Haleakala, helicoptered in to the top of the west Maui Mountains, underwater at Molokini Crater, on a boat off the coast of Maui, in the shark tank at the Maui Ocean Center, on a labyrinth at The Sacred Garden, on an island in San Francisco Bay, in Laguna Beach, San Juan Capistrano, a red rock ranch in the hills of Utah, a mansion in Nashville, Tennessee and a stunning horse ranch in England with the men all in kilts. 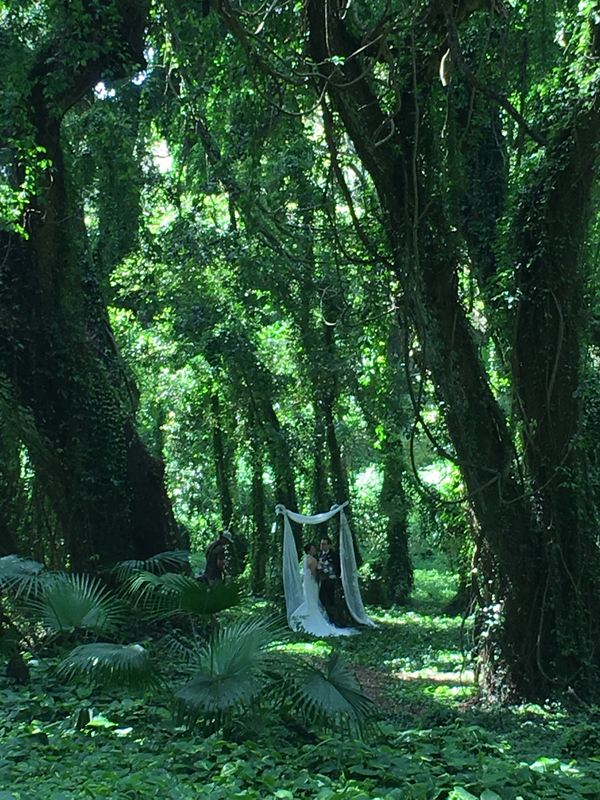 While Maui and the other Hawaiian islands are the most common place for Eve to perform ceremonies, if you would like Eve to officiate elsewhere, call and explore the possibilities. Labyrinth Weddings: This price varies depending on whether you are using Eve’s permanent labyrinth, portable labyrinth or a labyrinth in a distant location. In general, labyrinth weddings are $350. Ceremonies at The Sacred Garden are free of charge (Donations to the garden—a 501(c)3— are gratefully accepted). Fees may be charged separately for the coordination and planning. Boat and SCUBA Weddings: The pricing for boat weddings varies on size of boat, number of guests, whether it is a private charter or shared boat, photography/videography, etc. Please call for pricing. As a starting reference, a private boat Scuba wedding starts at $2000. 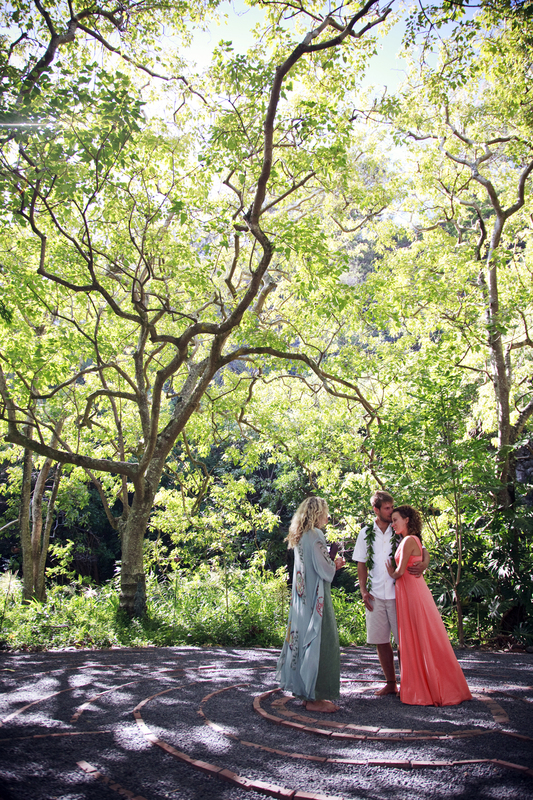 Weddings with Eve are also available at the Maui Ocean Center—even in the Shark Tank! We call that taking the Ultimate Plunge! Pre-marriage (or marriage) coaching: $125 an hour with a 2 hour minimum needed. Relationship, Marriage or Honeymoon Retreats: Price is variable depending on the number of sessions and days desired. These retreats are customized to your timeline, budget, needs and interests and can be a la carte sessions, a mix of vacation and sessions, or an intensive retreat. Soul-utions for Relationships Video Series $99 for four hours. While the wedding makes a magical day, relationship education makes a magical marriage. Whether on the labyrinth, beach or sea, Eve will work with you to design a ceremony to honor this sacred stage of your life. You must have a valid Hawaii marriage license to be legally married. There is no waiting period, no blood tests are required, and the license is valid statewide for 30 days. You do not need witnesses in Hawaii. Both partners must be at least 18 years of age (unless they have written consent from parents or legal guardians), and must appear together before a licensing agent on any island. Proof of age may be requested in the form of a driver’s license or I.D. If either partner has been married before, he or she will have to state the date, county and state (or country) in which the marriage was ended. The license also requires the full names of each partner’s parents and their place of birth. The fee for the license is $60, and is payable in cash to the licensing agent. For a complete packet of information, contact the Department of Health at (808) 586-4544. Each community has a licensing agent as well. Photography and videography are additional. Eve works with a number of excellent photographers and videographers. Greg Hoxsie and Benja Iglesis are recommended photographers. Kevin Herrington is recommended as an above water videographer and Steve Hogan for underwater videography. The pricing is hugely variable, generally $395-$495 starting and up. START YOUR MARRIAGE OFF RIGHT WITH MARRIAGE OR PRE-MARRIAGE COACHING!